About a year ago, Memphis icon Jerry Lawler suffered a heart attack live on the air at a WWE event. I didn’t quite realize until we almost lost him what he means to me culturally. For anyone who grew up in the South watching USWA Wrestling, Jerry Lawler is a big deal. In the 1970’s and 80’s, he was like Elvis in his cultural stature. This site is all about providing insight and sometimes defense of concepts that are often misunderstood and maligned. That could never be more true than the case for Professional Wrestling. Vince McMahon once said “To those who believe in the beauty of professional wrestling, nothing needs to be said. For those who don’t appreciate wrestling, nothing could be said to change their minds.” I’ll try anyway.The key is to accept that it is scripted and staged, and that most people -if not all people, by now- know that. Including the fans. A wrestling show is just that, a show. An often corny, often silly, never ending morality play. In which reality and unreality blend together to create the most meta of meta performance art. The all time best example is still the feud between Jerry Lawler and Andy Kaufman, which exploded out of it’s typical setting and into mainstream culture, fooling a lot of people who would’ve considered themselves far too intelligent to entertain the notion of any worth in Pro-Wrestling. David Letterman, at the time the notorious events unfolded on his show, wasn’t even sure. Jim Carrey, who played Andy in a movie, infamously tried to go “method” on Jerry on the set and get in his face. There are still people who believe that these guys really, truly hated each other. None of those people today are wrestling fans.Wrestling has some of the best backstage jargon and terminology of any subculture. A continually relevant sample: the good guys are called “babyfaces” and the villains are called “heels.” When one of these guys goes out in front of the crowd and says “You rednecks don’t deserve to even look at me” and words to that effect, cheats to win the matches, he’s the heel. When a character who had previously been beloved goes out and suddenly does that, usually with “you never appreciated me enough” as the storyline reason, it’s called a “heel turn.” And now, this is where it gets interesting. In what other form of live show business does a person go before an audience and intentionally provoke them to hate him? and furthermore, someone who is beloved by them? Well, Andy did it all around the television dial. He’s now regarded as a confused genius. I definitely think he was a genius. But confused? Never. 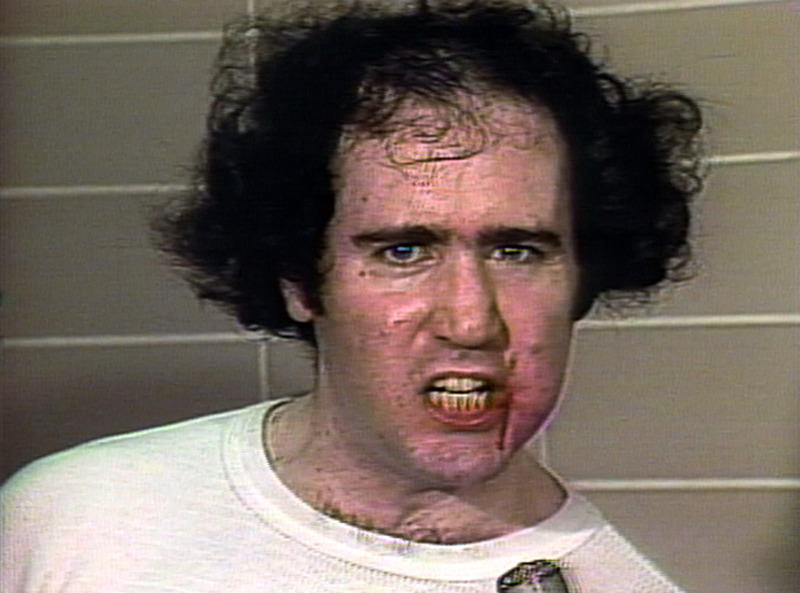 All Andy Kaufman did was take Professional Wrestling away from the unwashed masses and take it to the regular old masses, to huge and hilarious effect. → HAIL!! HAIL!! ROCK!! AND ROLL!! !